Blackpool have made free agent Marc Bola their 11th signing of the summer. 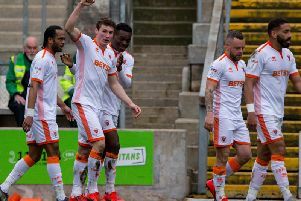 The defender, who had been on trial with Wigan Athletic until recently, has agreed an initial one-year deal with the Seasiders, with the option of a further 12 months. The 20-year-old was released by Arsenal last season having spent the campaign on loan at Bristol Rovers, making 23 appearances. The previous season he made 13 appearances during a loan spell at Notts County. “I’m delighted to join Blackpool and I just can’t wait to get started," Bola said. "I’ve had great years at Arsenal and I’m looking forward to building a new chapter now. While predominantly a left back, Bola is also capable of playing on the right-hand side of defence.